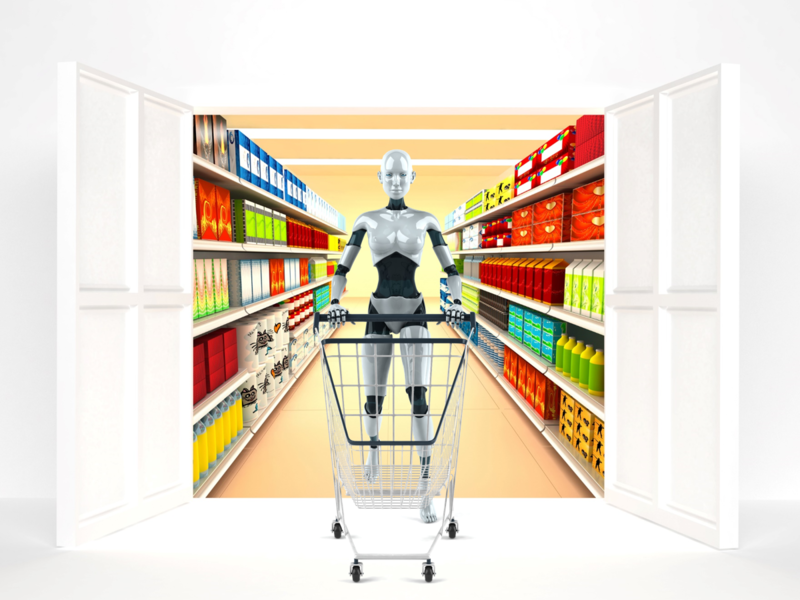 AUTOMATED SHOPPING TECHNOLOGY – ARE CUSTOMERS READY? With the roll-out of Quality Food Center’s (QFC) new automated shopping system in the USA, the competition for grocery store technology dominance just got tougher. Start-ups and technology giants alike have been racing to provide the most innovative and efficient shopping systems for several years – the median weekly U.S. household grocery expenditure was $125 last year – but it’s only recently that the check-out system as a whole has been disrupted. The question remains of whether the technologies will ever be widely adopted. The Scan, Bag, Go system built by American supermarket company QFC allows customers to scan items with a handheld device as they shop. The same device is then used at self-checkout kiosks to pay for everything at once. Automating check-out processes in supermarkets is nothing new, but this system disrupts the place in which automation occurs. At traditional self-checkouts, customers scan all their items at once – just as a store employee would. This means employees are often on hand to assist. QFC and Fred Meyer parent company Kroger has built a system not based on traditional check-out methods. The concept is to remove cashiers from the process altogether and reduce the amount of time shopper spend in-store. As there would no longer be queues formed by customers waiting to scan items, the technology could change the way stores are designed entirely. QFC isn’t the first company to try automation on this level. Tech giant Amazon made headlines when it opened the doors to Amazon Go, a cashier-less store that operates similarly to QFC’s. A customer can place items in a basket, and when they walk out the door the barcodes are automatically scanned, charging the customer’s Amazon account. This technology completely removes the need for cashiers, checkout lines, or even handheld devices. The flagship Seattle Amazon Go won’t be it’s only one – the company is rolling out stores across the U.S.
A short drive away from Amazon’s Seattle headquarters in Ava Retail, which has rolled out a system almost identical to Amazon Go’s. Ava Retail has collaborated with industry giants like Microsoft, Intel, and Mastercard. Their system uses a combination of sensors, beacons, cameras, artificial intelligence, machine learning, and smartphone apps to recognise products and track shoppers. The shoppers can simply pick up items, walk out, and have a receipt emailed to them. While entrepreneurs and investors see potential in the walk-out concept, some experts doubt imminent widespread adoption of the technology. This is the critical problem with disrupting the traditional process in one of the largest global industries. It requires a culture shift. Walmart abandoned a similar concept to QFC’s earlier this year after it failed to impress customers. There are also concerns about theft, privacy, and job displacement. Stores with these technologies in place will be able to harvest a massive amount of data from both customers and employees by tracking movements and purchases. Many automation start-ups and initiatives are trying for a slice of the U.S.’s $800 billion-dollar grocery industry. Compared to America’s automation Olympics, New Zealand has few initiatives underway. Supermarkets in New Zealand have had self-checkouts installed since 2016, and a considerable amount of major stores offer click-and-collect services. Kiwi start-up IMAGR is having their AI-powered shopping technology trialled by Foodstuffs this year. Their system SMARTCART is a computer vision technology that recognises products as soon as they are placed in a shopping cart, removing the need for barcode scanning, checkouts, and queueing. It’s impressive technology, but experts think click-and-collect and home delivery services will be the technology that goes the distance. Kroger recently launched an autonomous grocery delivery program in Arizona and partnered with Chinese tech giant Alibaba to sell groceries online abroad. Amazon famously invested in drone technology to make same-day deliveries in the U.S.
Amazon has also integrated its e-commerce arm with Whole Foods, launching a customer rewards programme, an Amazon credit card, and a grocery delivery service. In light of this, Amazon Go is just one arm of innovation for the shopping megalith. The company is valued at more than $900 billion, so can afford to develop and test new services that may not succeed. The U.S.-wide roll-out of Amazon Go may not indicate that walk-out technology will work for smaller start-ups. Next articleIS RUBY CHOCOLATE WORTH THE HYPE?